The red-hot Dow has finally cooled off a bit. After nine straight days of record highs, the Dow dipped 33 points on Tuesday. Wall Street was on track to extend that streak, but stocks retreated after President Trump promised "fire and fury" if North Korea makes any more threats against the United States. Any gain on Tuesday would have pushed the streak of records to 10, something that has only happened four other times since the Dow was established in 1896, according to Bespoke Investment Group. The record for consecutive records is 12. It was set in January 1987, months before the Black Monday crash, and tied in February, shortly after President Trump took office. 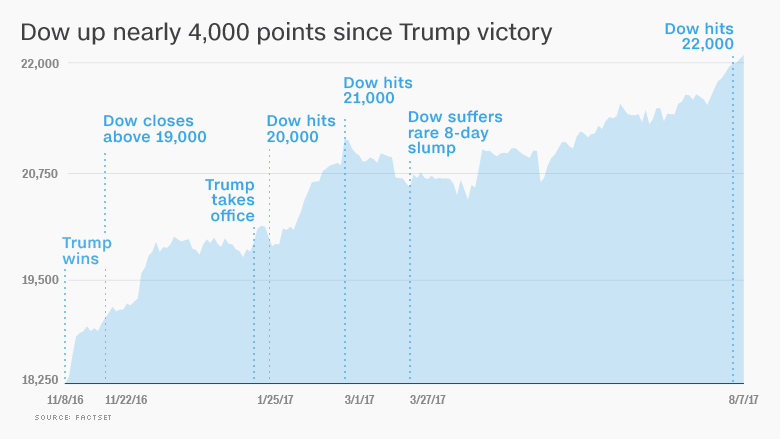 As impressive as that is, the Dow was only up about 400 points, or 1.8%, during its recent string of records. And the broader S&P 500 has lost ground on four of those record Dow days. In other words, the market isn't exactly going straight up. CNNMoney's Fear & Greed Index is sitting in "greed" mode, which is actually down from "extreme greed" a year ago. Nonetheless, the Dow has surged about 3,800 points since Trump's victory in November. 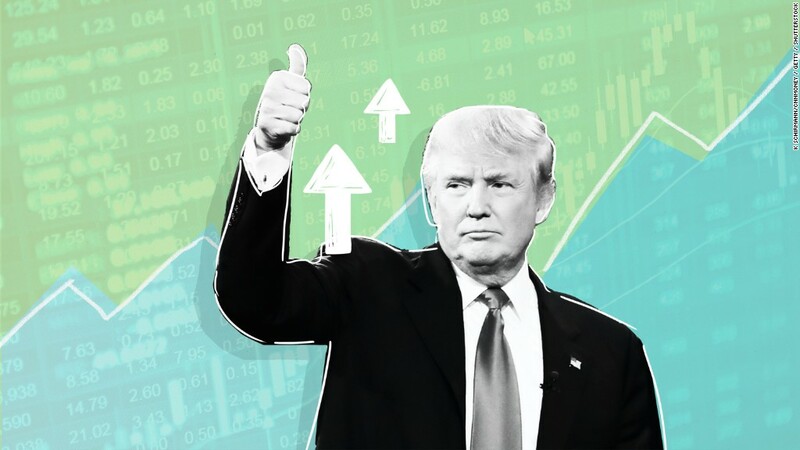 In recent months, Wall Street has managed to shrug off turmoil in the Trump administration and the president's failure to get his economic agenda through Congress. Instead, the market has been carried to new heights by strong corporate profits from the likes of Apple (AAPL), Boeing (BA) and McDonald's (MCD). Wall Street is also feeling good about the economy. The unemployment rate dipped in July to a 16-year low of 4.3%, and employers have added more than 1 million jobs since Trump took office. Economic growth doubled to 2.6% during the second quarter. The Federal Reserve has promised to raise interest rates at just a gradual pace to avoid disrupting the recovery or the markets. Evidently, many investors believe the market will do just fine even if Trump fails to deliver on his promise of "massive" tax cuts. Still, it could be healthy for the market to take a breather after all these records. The S&P 500 hasn't suffered a downturn of 5% or more in 406 days, the longest streak since May 1996. Challenges may loom for the market in the coming weeks. Congress needs to raise the debt ceiling to avoid a disastrous default. The Treasury Department has estimated it can meet its financial commitments for two more months.